overview : This hand-painted step-printed film begins with streaks of glare light and vibrantly colored forms apparently in the sky forinasmuch as there appears, frame center, the tapered shape of a tower, a silhouette as it were against the backdrop of the flaring sky. 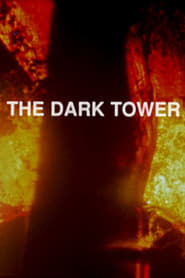 As this shape of tower disappears, the conflagration of scratches and paints seems grounded and takes on the semblance of a battle of knights, their lances, horses, et al, often against a scattering of star-like flecks until finally the silhouette of the tower reappears as if much closer, certainly thicker and straight-sided. The film finishes as textures which tend to suggest an entrance into the textured walls of the tower, textures and stars intermingled with what may well seem chain-mail as well.